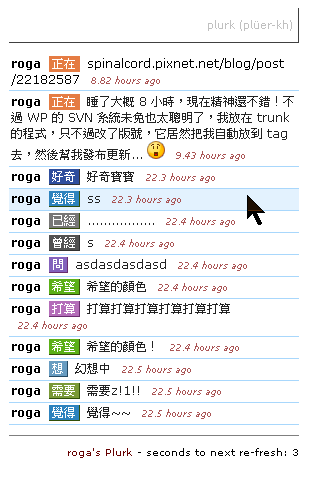 Author rogaPosted on February 14, 2009 June 27, 2017 Categories WordPress3 Comments on 重新安裝了 WordPress ! “Get your Plurk” could get your plurks from www.plurk.com, and show it on your sidebar. You may enable cache option to save the PHP page gerneration time. 在朋友 sotom 的部落格上面看到 wp 冬季應景外掛 – Let It Snow!，覺得很有趣，所以裝了起來，雪花是用 png 以及 gif 做成的，為了瀏覽器相容，所以預設是 gif ，但我們也可以透過設定強制使用 PNG 圖片.. Author rogaPosted on December 14, 2008 June 27, 2017 Categories WordPress2 Comments on Let it snow. using the Gravatar in WordPress. 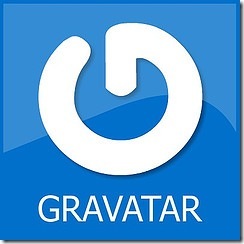 Gravatar is Globally Recognized Avatar, It can be identified by your email address or ID in http://www.gravatar.com/. 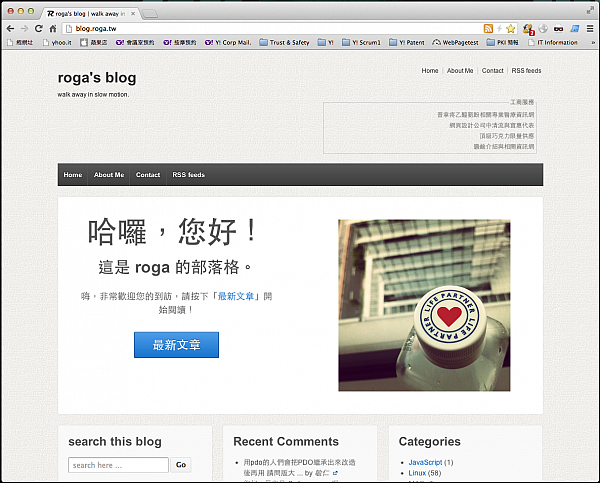 Author rogaPosted on November 30, 2008 June 27, 2017 Categories WordPress3 Comments on using the Gravatar in WordPress.